Using Fleuresse Eye Creme has the best results if used in conjunction with Fleuresse Serum, but can also be used on its own. As you age, your eyes can become fragile over time due to fatigue and dryness. Constant movement of the eyes over time allows fluids to build up and collect, causing puffiness and dark circles. Kyani Fleuresse added this eye creme to address this specific problem around the eyes, aside from the other individual products which make up the all natural Fleuresse system. Fleuresse Eye Creme uses naturally occurring botanicals in a delicate cream to boost your skin’s ability to reduce puffiness and the appearance of dark circles. This exclusive formula delivers essential hydration to your skin to smooth fine lines, diminish wrinkles, and give your eyes a radiant, firm, and timeless look. After Serum, apply a pea size amount of Eye Creme to ring fingertip and pat under the eye from the inner to outer corner. Follow with a gentle glide motion along the orbital bone to distribute evenly. For a more thorough use – with a light patting motion, apply one-half pump of Eye Creme around the orbital bone of the eye. Gently glide the crème over the area for even distribution. For maximum effectiveness, delicately rub the Eye Crème into skin, moving from the inner to the outer corners of your eyes. Allow the Eye Crème to fully absorb before applying the next product. 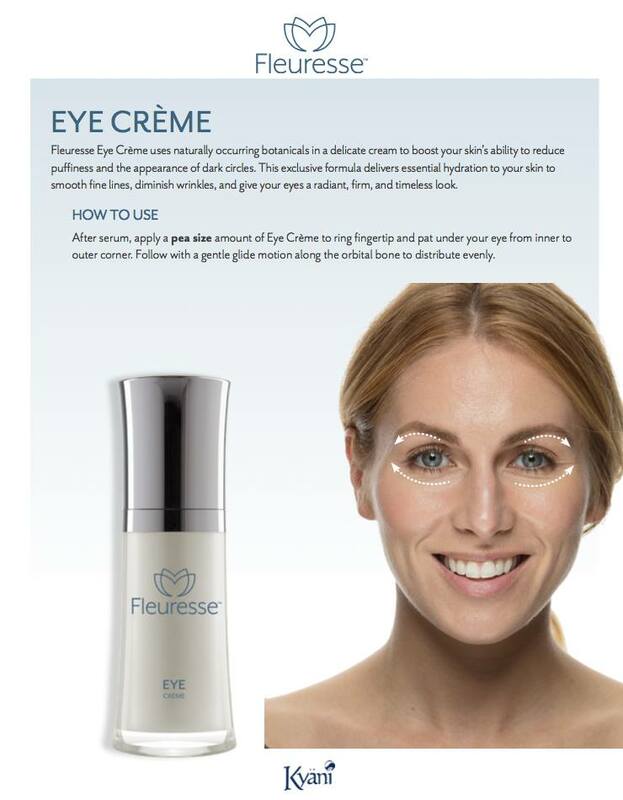 Please visit the Kyani Fleuresse Eye Creme page here for more info including placing an order. Note all product pages on this site link to Kyani’s Shops page to order online securely. Be sure to visit other all-natural products by Kyani on this site as well, such as the famous Triangle of Health!